Monbento, a French bento box company, sent me one of their bento boxes to review. As you guys know, I have a very ridiculous bento box collection, so it can actually be quite tough to impress me when it comes to boxes. 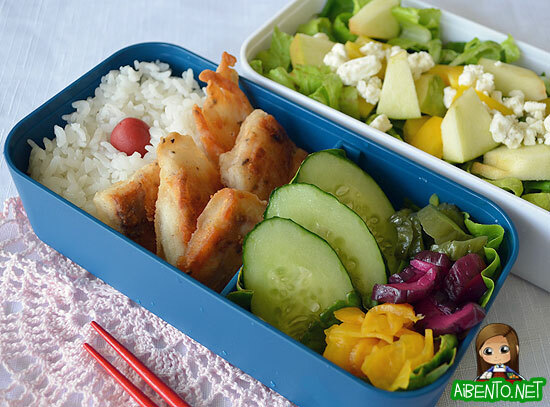 Luckily for the monbento, it’s got some extra flair to it that makes it stand out from the rest. Monbento sent me their navy blue box, which is great because I own way too many girly boxes. (monbento boxes are sold on Amazon!) Since I’ve been making a salad pretty much every day, I kind of left it sitting in the corner of my kitchen while I tried to think of something good to make for it. Losing weight without Weight Watchers has become a goal of mine since earlier this month and with one salad a day I’ve managed to lose almost 4 pounds in 3 weeks. Not bad at all! Anyway, Mr. Pikko said we had to eat some of his tilapias because they’re getting so big and eating all his food and we rarely eat them. 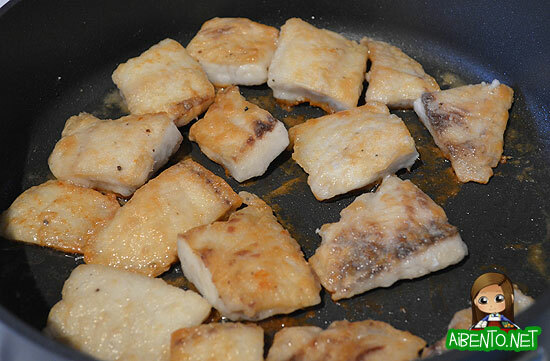 Usually I pan fry them and we pick at it but a lot of times it would go to waste because it was too much work. However, last week I tried to feed us without going to the grocery store to buy meat, so on Friday I asked him to catch two fish and we’d eat that. I looked up videos on YouTube and found a good one showing me how to filet a tilapia. It was actually extremely easy and I didn’t even need to gut or scale the darn thing, something I wish I’d known before I scaled and gutted them. I salted it, peppered it, floured it, and fried it up. I mean, it is true that I end up doing all the work making sure it’s boneless and skinless (my silly family won’t eat the skin even if I tell them it tastes amazing), but the tradeoff is that my two kids just snarf this stuff down. Once you take all the work out, it’s so easy to just gobble it up. And it obviously makes great bento food. Buddy asked for some pieces to accompany his lasagna bento (gross, right?) and we all nibbled on pieces for breakfast too. I packed in my lunch some of the fried tilapia, rice and ume, slices of cucumber (which we grew), and a variety of pickles. In the other tier I have a salad with lettuce Mr. Pikko grew, yellow bell peppers, chopped green apple, and feta cheese. What’s immediately apparent about the box is the soft outer texture. 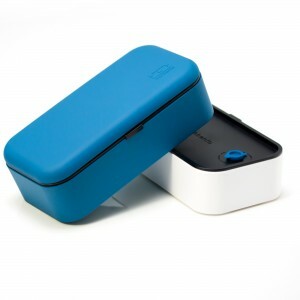 It has that silky soft silicone texture to it while the inside of the box feels like regular smooth plastic. The monbento comes with seven pieces total. There are two box tiers (the blue and the white you see), there’s one divider that you can see behind my cucumbers, box covers, a cover for the box, and the strap to wrap the whole thing together. The really cool part is in the box covers because I’ve never seen anything quite like it. Made out of silicone, the covers for each tier have a little hole in them with a silicone stopper in it. And this is the amazing part. As long as the little stopper is plugging the hole, the cover doesn’t budge, sealing your food and its juices inside. There have been so many times where I pull my bento out of my bag and realize that my pickles have leaked out vinegar juices or my teriyaki chicken has oozed sauce all over my newly washed bag. I was truly amazed. And what’s even better is that as long as you remove the little blue stopper, you can microwave the whole thing, cover and all. 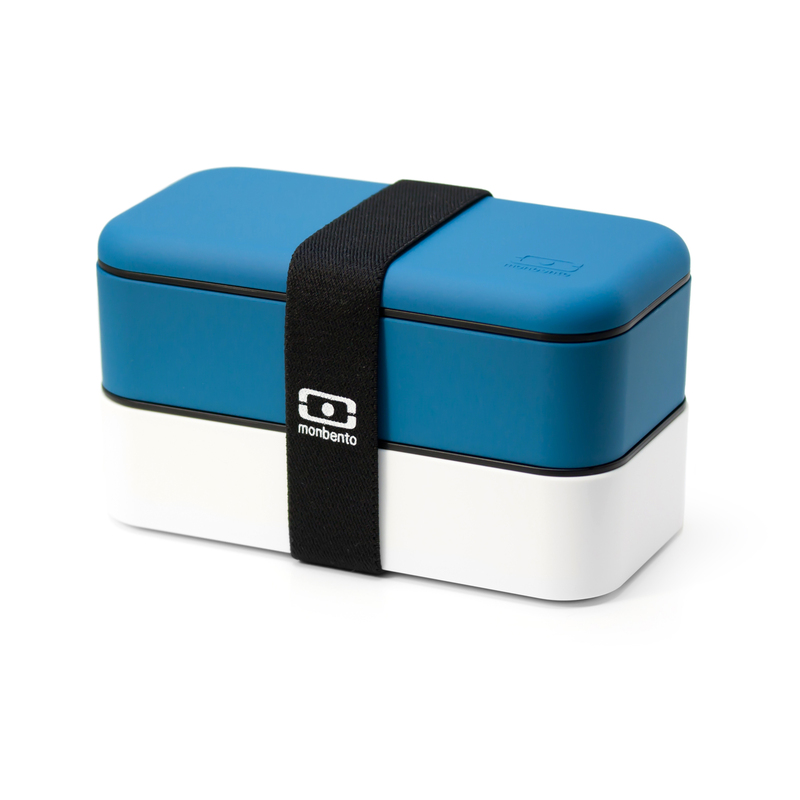 The top blue cover has a space inside for you to place utensils, but you’ll probably have a hard time finding one of your own that fits, so if needed, purchase one of their cutlery sets. As for me, I’m a chopsticks kinda lady. If you weren’t sure about the photo, the chopsticks are retractable. How freaking amazing is that? As I mentioned earlier, the monbento line is sold on Amazon, which is really great for us folks here in the US. The boxes are expensive at $36, rattling the cheapskate that lives inside my head, but after holding one in my hands I’m convinced that this box is worth way more than say, two Hello Kitty bento boxes from the Sanrio store (which would cost around… $36). 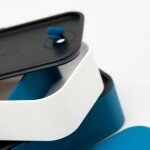 The quality is just immediately evident and you have to hold one to fully understand how sturdy and well made it feels. The box runs on the bigger side, making it pretty ideal for men and sizable for a woman. I filled my second tier with a salad and juicy fruits wouldn’t be a bad option either since the container seals itself up tight with the stopper. The monbento is dishwasher safe, but with a quality box like this, I’ll probably stick to handwashing. Similar to the Anolon pans set I bought recently, which is dishwasher safe, I just don’t want to risk it at all because I love them so much. My overall impression of the monbento is overwhelmingly positive. I love the feel, the quality, the colors, and the fact that it’s waterproof. This is most definitely a bento box to invest in. 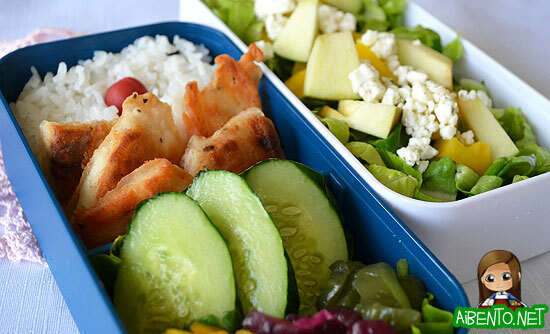 My only criticism is that the size runs a little bit bigger than what I have been wanting to pack, so I hope to see them come out with a single tier bento box for people looking to pack a smaller lunch. Update: monbento has informed me that the strap for the box can be used lengthwise to make it possible to use just one tier!